It would be easy for the modern reader to conclude that women had no place in the world of early modern espionage, with a few seventeenth-century women spies identified and then relegated to the footnotes of history. If even the espionage carried out by Susan Hyde, sister of Edward Hyde, Earl of Clarendon, during the turbulent decades of civil strife in Britain can escape the historiographer’s gaze, then how many more like her lurk in the archives? 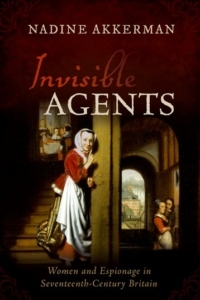 Nadine Akkerman’s search for an answer to this question has led to the writing of Invisible Agents, the very first study to analyse the role of early modern women spies, demonstrating that the allegedly-male world of the spy was more than merely infiltrated by women. This compelling and ground-breaking contribution to the history of espionage details a series of case studies in which women — from playwright to postmistress, from lady-in-waiting to laundry woman — acted as spies, sourcing and passing on confidential information on account of political and religious convictions or to obtain money or power. Nadine Akkerman is a Reader in Early Modern English Literature at Leiden University. She has published extensively on women’s history, diplomacy, and masques, and curated several exhibitions. In the academic year 2015/16 she was Fellow at the Netherlands Institute for Advanced Study in the Humanities and Social Sciences (NIAS-KNAW). She is the editor of The Correspondence of Elizabeth Stuart, Queen of Bohemia (OUP, 3 volumes, of which the first appeared in 2011), for which her prize-winning PhD (2008) serves as the groundwork. She is currently writing a biography of Elizabeth Stuart (forthcoming from OUP). In 2017, the World Cultural Council recognised the transformative effect of her work in the form of a Special Recognition Award.